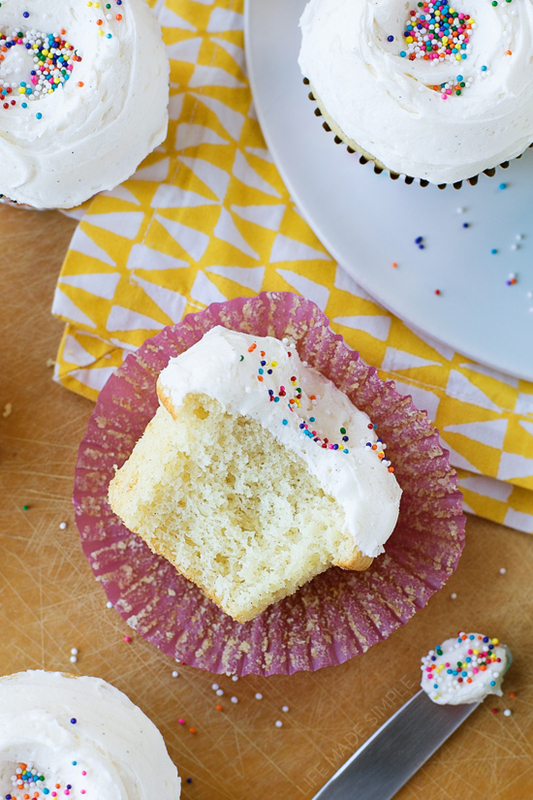 A good classic vanilla cupcake recipe is something that everyone should have in their recipe box! 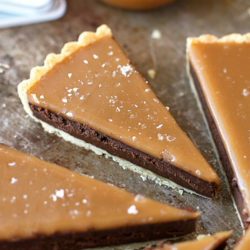 It took me a few attempts to finally find one that I really love, and today I’m sharing it with you! 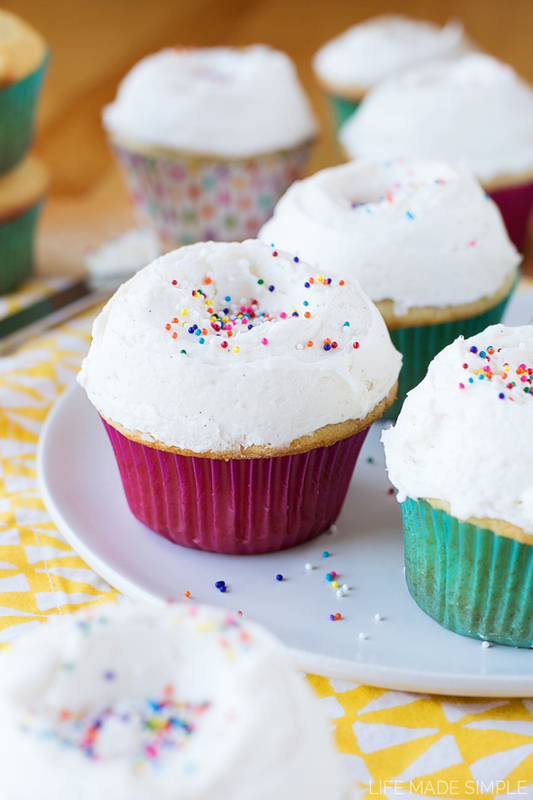 These cupcakes are delicate, moist and full of buttery vanilla goodness! They’re sure to be the star of just about any occasion- seriously though, they are perfect! So what makes these cupcakes so amazing? I’m glad you asked 😉 It starts with a lot of butter, some granulated sugar and both vanilla extract and vanilla bean. First, let me just say that they key to delicious vanilla cupcakes is using real extract. Second, is the use of vanilla bean. I love love love Nielsen-Massey’s madagascar bourbon vanilla paste, but you can also use the inside of an actual vanilla bean too. Either way it’s an essential ingredient! Cream those together until light and fluffy, it usually takes me about 2-3 minutes on high to get the pale color I’m looking for. Next incorporate two whole eggs (they help add moisture, fat and aid in the leavening process). Then, in a small bowl, I like to mix together a combination of sour cream and whole milk. I’ve done one or the other but found that overall, equal parts of each results in a tender and moist cupcake. Set that aside and whisk together the dry ingredients: all-purpose flour, cake flour, baking powder, baking soda and salt. Make sure to use cake flour… I know it’s another “special ingredient”, but you can use the rest of it in this pumpkin cake, these lofthouse style cookies, or these red velvet cupcakes. It makes a huge difference in the texture of these cupcakes! Now alternate adding the dry and wet ingredients to the sugar/butter mixture. Mix just until batter is smooth and homogeneous (being careful not to over mix). Scoop the batter into the cupcake liners, filling each ⅔ of the way full. Place in the oven and bake for 17-19 minutes or until the cupcakes spring back when touched. Over baking will result in dry tough cupcakes, so watch them around the 16 minute mark and keep a close eye on them. Remove from oven and allow to cool in the pans for 5 minutes before removing and transferring to a wire rack to cool completely (about 25 minutes). 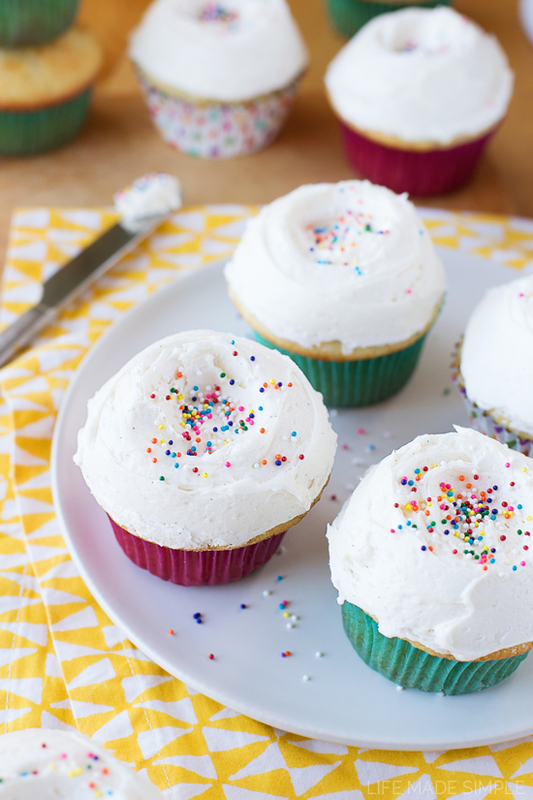 While the cupcakes are cooling you can easily whip up the frosting. The overall flavor of the frosting is just as important as flavor of the cupcakes. I mean, no one wants a delicious cupcake with less than delicious frosting, right? That’s why were using both vanilla extract and vanilla bean again! In the bowl of a stand mixer fitted with the whisk attachment, combine the butter, vanilla extract, vanilla bean paste (or vanilla bean “seeds”), and salt. Beat until fluffy (2-3 minutes). With mixing speed on low, add the heavy cream, then gradually add ½ c. powdered sugar at a time until the mixture becomes soft but firm enough to hold it’s shape. Beat frosting for an additional 3 minutes until light and fluffy. If the consistency is too thick, add a little more cream and beat for 30 seconds more. Taste to see if it needs more salt to balance out the sweetness of the powdered sugar. A lot of people forget to do this and it really makes all the difference! When the cupcakes are cool, pipe or spread the frosting onto them. I wanted a more vintage look so I used an offset spatula to make sort of a frosting nest and then poured the sprinkles inside. It was kind of fun and it gave them a unique look that I love. Anyway, how you decorate them is totally up to you! Serve these up and I guarantee they’ll be gone in seconds! 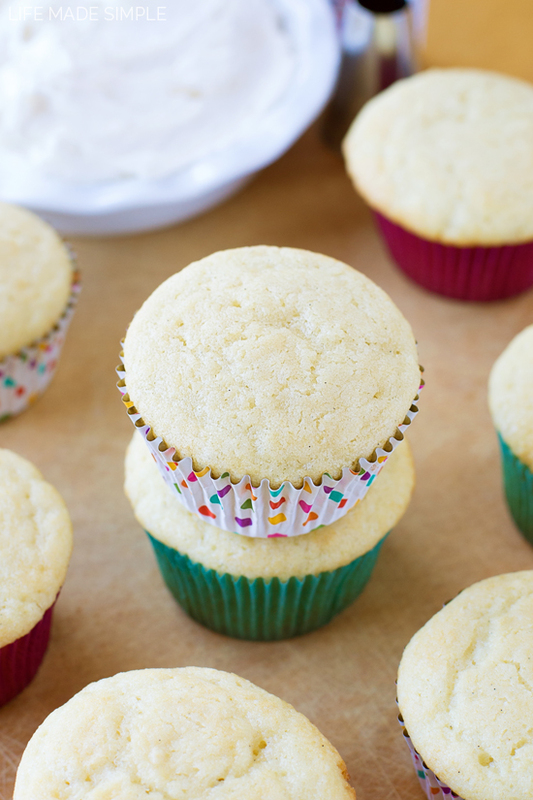 These vanilla cupcakes were so delicious, I hope you’ll think so too! Everyone needs a go-to classic vanilla cupcake recipe, this is mine! 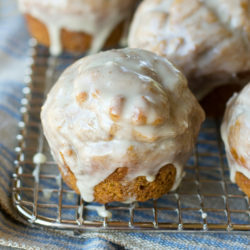 They're moist, tender and full of the most delicious buttery vanilla flavor! Preheat oven to 350 degrees. Line two standard cupcake pan with 16 liners, set aside. In the bowl of a stand mixer, cream the butter and sugar until light and fluffy, about 2-3 minutes. Add the vanilla extract and the vanilla bean paste. With mixing speed on low, add the eggs one at a time, mixing until just combined. In a medium size mixing bowl whisk together flour, cake flour, baking powder, baking soda, and salt. In a glass measuring cup mix together sour cream and milk. With mixing speed on low, alternate dry and wet ingredients, mix until batter is smooth and homogeneous (being careful not to over mix). Scoop the batter into the cupcake liners, filling each ⅔ of the way full. Place in the oven and bake for 17-19 minutes or until the cupcakes spring back when touched. Remove from oven and allow to cool in pans for 5 minutes before removing and transferring to a wire rack to cool completely (about 25 minutes). 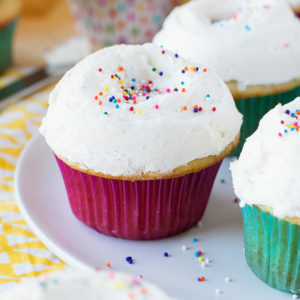 While cupcakes are cooling, in the bowl of a stand mixer fitted with the whisk attachment, combine butter, vanilla extract, vanilla bean paste, and salt. Beat until fluffy (2-3 minutes). With mixing speed on low, add heavy cream, then gradually add ½ c. powdered sugar at a time until the mixture becomes soft but firm enough to hold it’s shape. Beat frosting for an additional 3 minutes until light and fluffy.If the consistency is too thick, add a little more cream and beat for 30 seconds more. Pipe or spread onto cooled cupcakes, decorate with sprinkles if desired. *If you can't find vanilla bean paste, scrape out the inside of 1 vanilla bean. ** Scrape the inside of ½ a vanilla bean for the frosting. 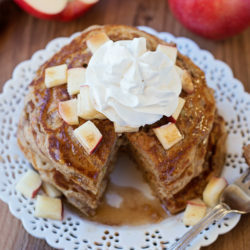 These look so fluffy and delicious! Love them! They are just that! Thanks for stopping by!